It's my mom's 63rd birthday today and I'd like to share one of her amazing recipes! This is what I call my "superfood" stew. I remember her making it with home-grown kohlrabi when I was a kid. My mom's traditional version is served with Czech dumplings, which is a bread-like side dish that gets infused with sauce, gravy or anything else you serve it with. 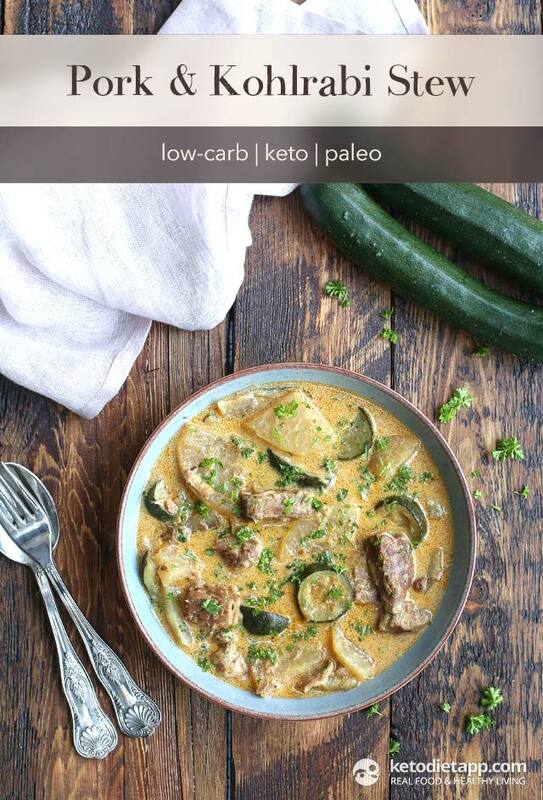 This is my low-carb version, so I skipped the dumplings and instead used extra zucchini to bulk it up. If you can't find kohlrabi, you can try turnips. I prefer kohlrabi, because it adds more flavour and doesn't taste bitter like some turnips do. 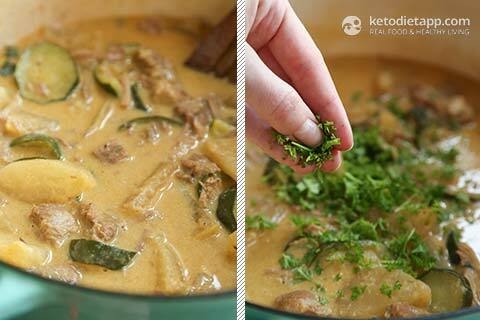 Apart from being keto and paleo friendly, this meal is a great source of magnesium (43% RDA) and potassium (88% EMR) - electrolytes that are often deficient in low-carb diets. 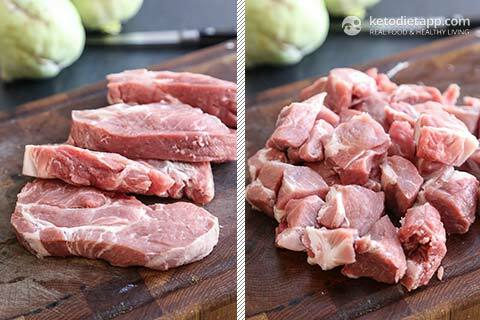 Using a paper towel, pat dry the pork and season with salt and pepper from both sides. Cut into medium-large chunks, about 1 - 1 1/2 inch (2-4 cm) thick. If using fresh onion instead of onion powder, fry it briefly in the pot greased with ghee, for 3-5 minutes before adding the meat and spices. Meanwhile, peel and slice the kohlrabi into 1/2 inch (1 cm) pieces. Once the pork is tender, add the kohlrabi slices and cover with a lid. Cook until tender, for about 30 minutes. 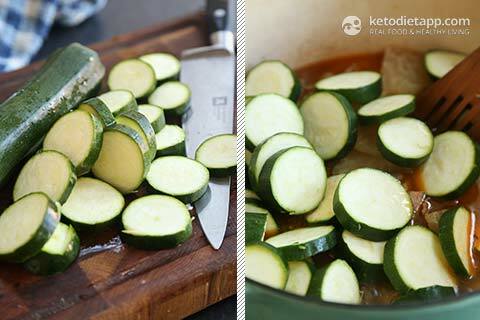 Slice the zucchini into 1/2 inch (1 cm) pieces. After the kohlrabi has been cooked for 30 minutes, add the zucchini slices to the pot and cook for another 10 minutes. 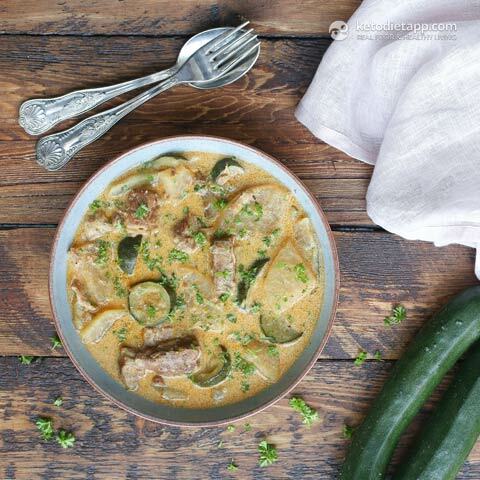 When the zucchini is tender, slowly pour in the egg & coconut milk mix wile stirring. Cook for about a minute and then, turn off the heat. Season with more salt and pepper to taste. Add freshly chopped parsley or chives. Serve warm or let it chill and refrigerate for up to 5 days or freeze it in batches and store for up to 3 months. 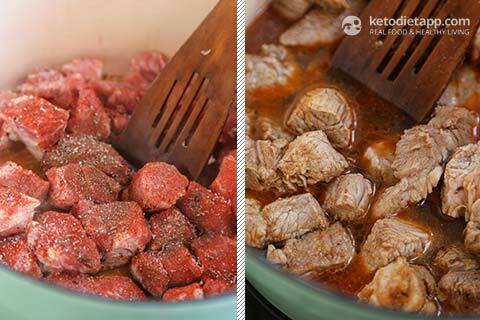 If using a slow cooker (crockpot), double the recipe. Place everything – apart from the kohlrabi and zucchini – in the slow cooker and cook on high for 4-5 hours. Add the sliced kohlrabi and zucchini in the last 2 hours of the cooking process. Alternatively, you can use a pressure cooker to cook the pork. 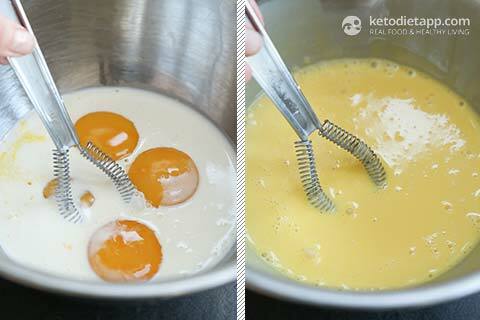 It will take just about 15-20 minutes, so you'll be able to make this dish in an hour. After the meat is tender, add the vegetables and sauté for about 30 minutes. Could you sub in rutabagas (Swede) for kohlrabi? 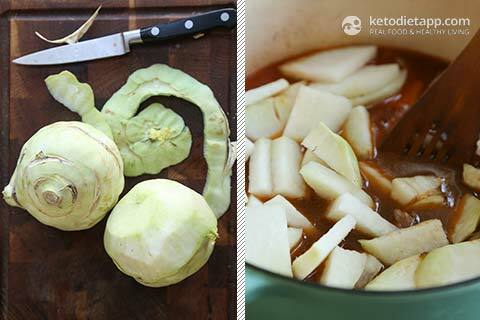 Yes, you can use turnips (similar carb count as kohlrabi) or rutabagas (higher carb count but still suitable for keto). I hope this helps! Was hoping you could shed some light on what a std. serving size is. May sound like a silly question but i have been recording by food intake on mfp and the serving size generally corresponds to 1 cup, 100 gms or 1 ounce. This looks lovely. The RDA for potassium is 4700mg. I dont know what EMR is but it appears deceiving. 1778mg is a good potassium amount tho! Hi Janet, calories are listed here as "kcal". 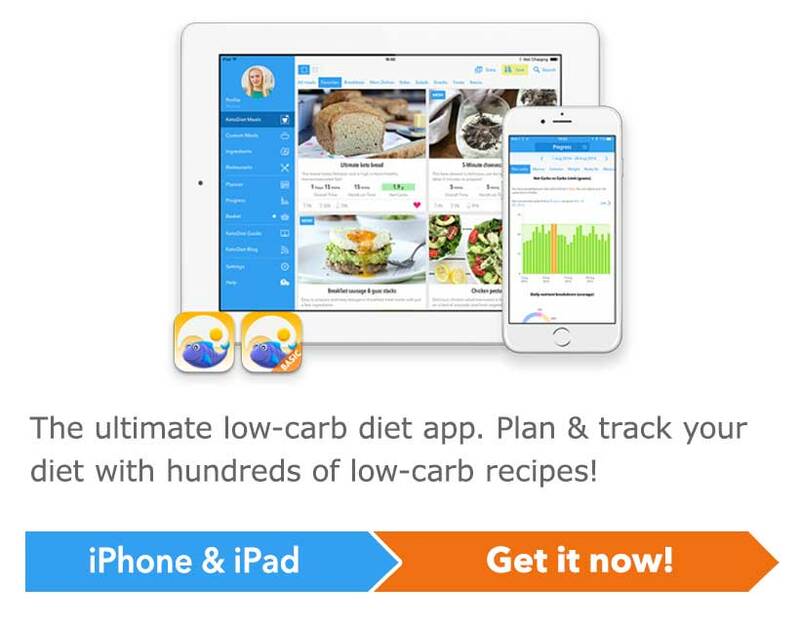 The Android version is work in progress - please, have a look at this post for more info: KetoDiet Basic for Android is Out! (I can't give exact date yet, but we are doing our best to have it done this summer). Looks fabulous! Can't wait to try. Love your recipes and cookbook.